Two archaeologists have put forward a theory that one of the most common ancient monuments seen around Ireland may have been used for brewing ale. While nursing a hangover one morning - and discussing the natural predisposition of all men to seek means to alter their minds Mr Quinn came to the startling conclusion that fulachts could have been the country's earliest breweries. Fulacht fiadh - horseshoe shaped grass covered mounds - are conventionally thought of as ancient cooking spots. But the archaeologists from Galway believe they could have been the country's earliest breweries. To prove their theory that an extensive brewing tradition existed in Ireland as far back as 2500BC, Billy Quinn and Declan Moore recreated the process. After just three hours of hard work - and three days of patiently waiting for their brew to ferment - the men enjoyed a pint with a taste of history attached. Three hundred litres of water were transformed into a "very palatable" 110 litres of frothy ale. 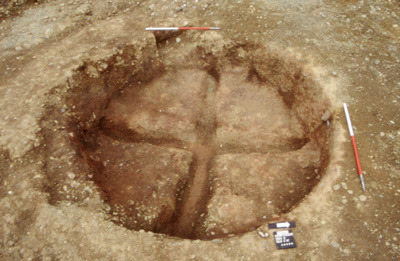 "It tasted really good," said Mr Quinn, of Moore Archaeological and Environmental Services (Moore Group). "We were very surprised. Even a professional brewer we had working with us compared it favourably to his own. "It tasted like a traditional ale, but was sweeter because there were no hops in it." The two archaeologists set out to investigate their theory in a journey which took them across Europe in search of further evidence. On their return, they used an old wooden trough filled with water and added heated stones.